The Starving Artist's Street Team on etsy is having a sale. Thursday July 30Th through Sunday August 2ND select members of the sateam will be offering specials in their etsy stores. The FamiLee Jewels is offering free shipping on all items purchased in this time period and a free gift for any purchase over $25. Tasha of For You Designs has made an etsy treasury for some of the items that will be on sale. She was kind enough to include Bonnie's copper wrapped beach coral necklace. Thank you Tasha. 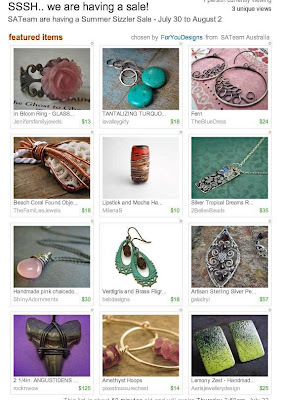 For You Designs is an etsy store that features artisan jewelry with a distinctive flair. Tasha's jewelry shows her love of color and texture. She is passionate about her work and draws her inspiration from the endless palette that nature provides. Treat your eyes to a trip through For You Designs and enjoy Tasha's timeless artistic interpretation's, crafted with quality.